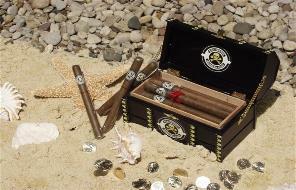 NEW PRODUCT: Rum Runner Caribbean Cigar®Pirate Treasure Chest! Our Rum Runner® Caribbean flavored cigars possess a hint of Rum sweetness combined with a fine blend of tobaccos to ensure your smoking pleasure. This hand rolled, 100% natural tobacco cigar is just the thing when you want something different. 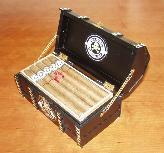 We offer these cigars in six popular sizes.